Going green is the right thing to do for business. It is also the smart thing to do. The more eco-friendly your company is, the more consumers will want to do business with you. Environmentally responsible businesses can minimize their carbon footprint while increasing their profits. But, going green for business is about more than just creating an environmentally responsible office building. What you put inside the building is just as important. There are many different types of green office furniture. If you are an environmentally responsible business owner, you need to furnish your office with environmentally sustainable furniture. Find out the 5 types of furniture for green office buildings below. Buying antique office furniture is one of the most environmentally friendly ways to furnish your office. It is also the most fiscally responsible. Pre-owned office furniture is much cheaper than new desks and chairs. In fact, you can often find old office furniture available for free with pickup when you do a bit of searching online. As long as your used office furniture is still in good condition, no one will be any wiser about its origin. And, you can still tout your green business office in client communications without having paid a cent for fancy eco-friendly furniture. These are just a few of the many reasons why used office chairs and desks are some of the top green office furniture to look into purchasing. Office furniture made with reclaimed materials is another one of the top types of furniture for green office buildings. Office shelving and desks made of reclaimed wood make for a beautiful office environment. They also tend to last longer. These types of green office furniture use sturdier materials that stand up to wear and tear better over the years. Reclaimed glass office decor, reclaimed wood furnishings and reclaimed steel office storage products are just a few of the reclaimed office furniture options that you can look into. Keep this in mind to design a green office for your business. Bamboo office furniture is another environmentally friendly option for a green building. Bamboo is a sustainable and light weight construction material used to make furniture both for the office. While it is much more environmentally friendly than traditional office furnishings, it is still just as beautiful and high-quality as some of the best office copiers. In fact, buying bamboo office furniture can elevate your office design overall with its sleek, smooth finish. 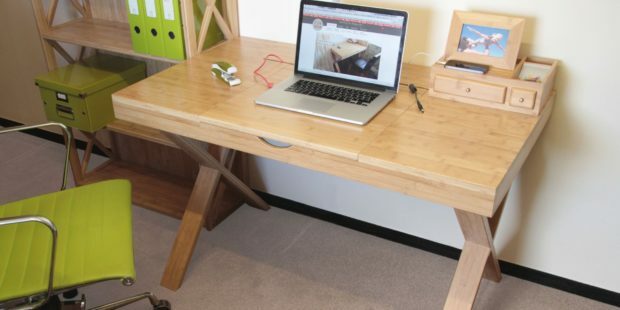 This is just one of many materials that can help your business go green, but it is certainly among the list of the 5 best types of furniture for eco-friendly offices. Office furniture made from cork is another variety of environmentally-sustainable office furniture. Cork furniture is one of the newest types of products to hit the market. It is also one of the most environmentally friendly for green office buildings. Cork desks, cork shelving and cork storage are just a few of the cork office products you can use to furnish an environmentally-responsible office. Some of the products re-purpose old wine corks to make furniture. Others make use of new cork to create new cork office furniture, as it is a highly sustainable material. These types of furniture will make your green building look bold, modern and sleek. Office furniture that has been certified as environmentally friendly is the best type of green building furnishings to buy. In order to receive Cradle to Cradle certification, ANSI/BIFMA level certification and SCS Indoor Air Advantage certification, office furniture must meet stringent guidelines to prove its environmental sustainability. When you shop office furniture with eco-friendly certifications, you help the environment as well as your business’s bottom line. It can qualify you for LEED credits, which will lessen your business tax burden at the end of the year. The tax savings businesses benefit from with ANSI/BIFMA level, SCS Indoor Air Advantage or Cradle to Cradle certified office furniture make these options some of the best eco-friendly office furniture pieces for green buildings. 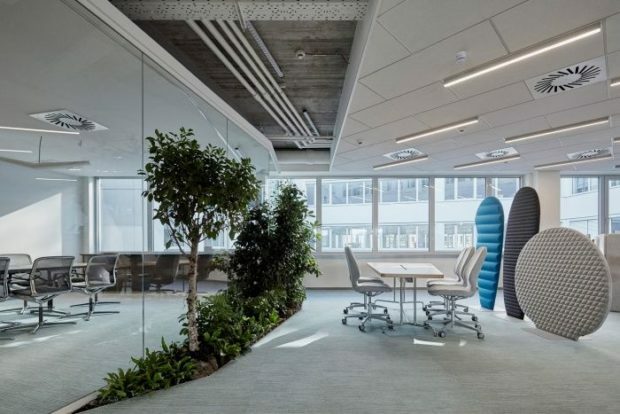 Furnishing a green office building requires a bit more research, planning and shopping than most businesses owners are used to. You may have to choose between eco-friendly worktops and regular table tops. However, it is certainly a worthwhile endeavor to limit your business’s ecological footprint and promote social responsibility at your organization. Consider these types of furniture for green office buildings above. These green office furniture options are some of the most stylish, sustainable furnishings you can find. They can also benefit your business’s finances while furnishing your green office building space.